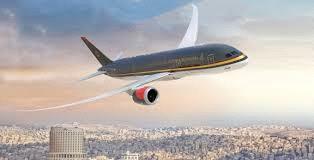 AMMONNEWS - The Royal Jordanian (RJ) announced new discounted fares on its global network flights from September 3 to 14, 2018, under the promotion scheme "Fares You’ll Autumn-atically Buy", to reflect the Autumn season. Travel with the discounted fares can take place any time between October 1, 2018, and May 15, 2019, except during the holiday season (Christmas, New Year and Easter), for a maximum stay at the destination of one month. This global promo runs in Jordan and most of RJ’s destinations on the route network, except Cairo, Doha, Istanbul and Copenhagen. It includes round-trip fares on Economy Class from Amman to Aqaba, at JD49; to Beirut, Larnaca and Athens, at JD169; to the Gulf and Iraq, at JD189; to North Africa, at JD239; to the Far East, at JD339; to Europe, at JD369; and to RJ’s stations in North America, at JD499. All prices include taxes. Passengers flying from Amman to North America are allowed two bags, each weighing 23kg; those flying from Amman to the Far East are allowed one bag weighing 23kg. Travelers flying from Amman to the rest of RJ destinations can purchase weight allowance for one bag weighing 23kg for cheap prices. Passengers coming from any RJ destination to Amman, or via Amman, are offered similar attractive ticket fares, which vary by destination. RJ President/CEO Stefan Pichler said: "RJ is keeping its promise to offer incredible fares. This autumn, we are glad to give our customers great value for their journeys on our international route map. Be our guest on your next trip, and we will be glad to serve you!" Customers who wish to benefit from this autumn’s fares can book their seats through www.rj.com, the airline’s mobile application, Call Centre at +962 5100000, or visit RJ’s global sales offices or travel agents.